For many years I have been aware that in the herbarium of the Royal Botanic Garden Edinburgh (E) is more than one set of specimens collected in South India by William Roxburgh (1751–1815). The sets are distinguished by mounting papers of different dates, colours and styles, and by their means of labelling – with annotations in a variety of hands (some written on the sheet, some on attached tickets). Forman (Kew Bulletin 52: 513–34, 1997) discussed the typification of Roxburgh’s names, and the problems that have arisen from the lack of herbarium collections and their wide dispersal. He quoted Stafleu & Cowan (TL II 4: 954, 1983) gave six major holdings of Roxburghian specimens, at: K, BM, BR, E, G and LIV, together with 11 smaller ones. Although Roxburgh sent herbarium specimens back to several correspondents in Europe in the period before he moved to Calcutta, he apparently did not keep a ‘top set’ of specimens for himself, perhaps preferring the illustrations he commissioned from Indian artists (his ‘Icones’) as vouchers for the written descriptions in his manuscript Flora Indica. Many of the names he published have accordingly been typified on the drawings. It has always seemed possible and desirable that a closer investigation, especially of the Edinburgh collections, might allow typification of the names, at least of some of his plants described from South India, by means of specimens (or at least to use these to supplement existing illustration-based typifications). But for this the complexity of the Edinburgh sets must first be addressed. While much remains to be done, some preliminary remarks can be made here. 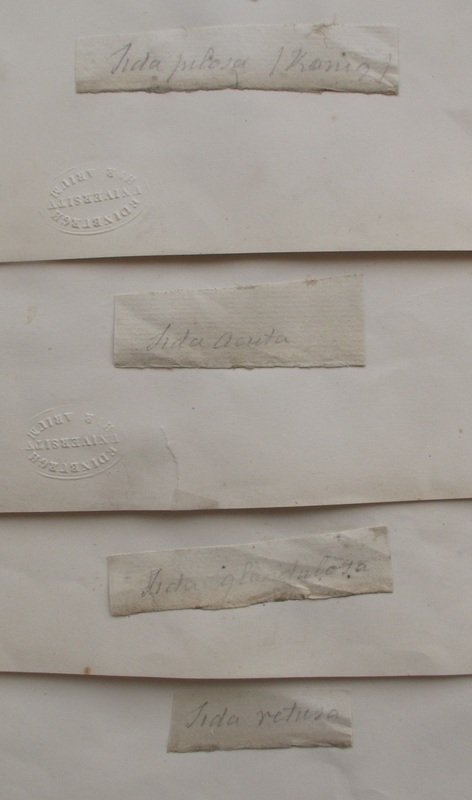 One set of Roxburgh specimens is straightforward: easily identified, and well documented. It was described by Charles Waterston in his fascinating account of the collections of the Royal Society of Edinburgh (Collections in Context, 1997). This collection was sent to the Society by Roxburgh from the Madras Presidency in around 1789 (perhaps as a symbol of Roxburgh’s newly acquired botanical status) and was catalogued in Edinburgh shortly thereafter by the Jamaican botanist William Wright. The ‘Catalogue of Plants, natives of India, chiefly those growing near Madras, collected by William Roxburgh MD, Botanist to the East India Company, and by him presented to the Royal Society of Edinburgh 1792 [sic, actually c 1789]’ survives in the RBGE archives, containing entries for 565 species arranged in Linnaean classes, the plant identifications made by Wright. At least a majority of the specimens survive in E – for example see a typical Catalogue entry and the related specimen labels for four species of the genus Sida. As will be seen these have been remounted, in the 19th century, on a whitish wove paper, to which the species name, in pencil in Wright’s hand was cut out from the original 18th century laid paper, to form a ticket. In many (but not all) cases the name is accompanied by two Arabic numerals referring to the Class and species numbers in the catalogue. In the catalogue the Class number is given in Roman numerals, so that, for example, Class VItus Hexandria . No 6 Gloriosa superba’ in the catalogue becomes ‘6. 6 Gloriosa superba’ on the ticket attached to the sheet. Nothing is known of the origin of the other collections. Although Roxburgh is known to have sent Hope descriptions of plants (Anacardium orientalis and Santalum album NAS GD/253/144/3 40 and 48) and seeds (see financial accounts for payment of freight of seeds and plants from Roxburgh to Hope in Sep 1778 – NAS E414/42) there is no mention of herbarium material, but he must surely have also sent this. Roxburgh also sent seeds to Banks with duplicates for Hope (see letter from Samalcottah, 10 xii 1784, Chambers 2009, 2: 82). The problems arise from the fact that all the early collections sent either to Hope, or to Edinburgh University, were recurated in the mid-19th century, with the loss of large numbers of (presumably decayed) specimens, and of information on those that were retained. Part of this happened with the amalgamation of the Botanical Society of Edinburgh and University herbaria (1839–42) in the time of Robert Graham’s Regius Keepership, and there was a later curation of the Indian collections around 1850, in J.H. Balfour’s time, by Hugh Cleghorn and Thomas Anderson. Over the years I have attempted in a half-hearted way to make sense of the collections, but with little success. When, during the preparation of a biography of John Hope, it was realised that at least a few fragments of Hope’s herbarium had survived within the general collection (the largest part being the easily identified specimens collected at Aleppo by Hope’s pupil Adam Freer), he started to extract some examples of the different Roxburgh collections, in the initial hope that some might also prove to have come from Hope’s collection. 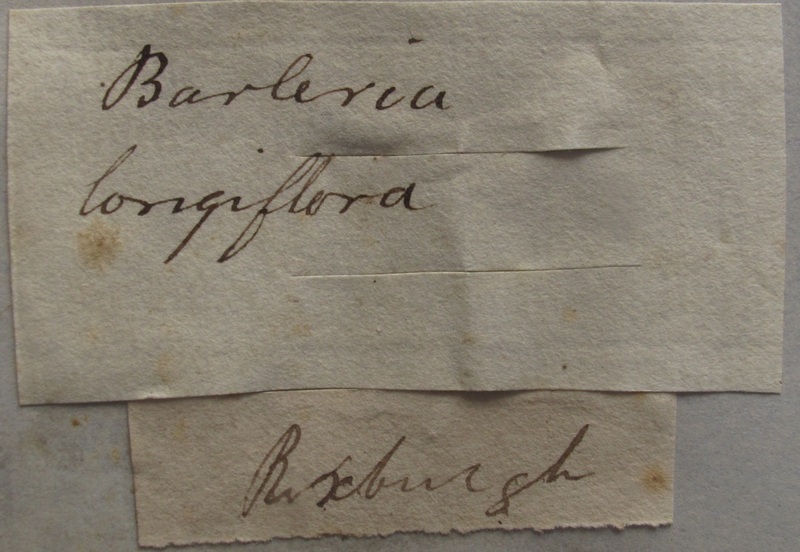 From such herbarium ‘angling’ it appeared that at least two other distinct sets of specimens bearing the annotation ‘Roxburgh’ are present, but that one of these is wrongly labelled, and, as will be shown, represents the lost collection of Patrick Russell. First, a set remounted, possibly in the 1840s, most commonly on bluish laid papers, but none with dated watermarks. These sheets bear the name ‘Roxburgh’ on a small piece of cut-out paper in an unknown hand of uncertain date, and a slip of paper with the plant name that in some cases is in Roxburgh’s own hand (matching the examples given by Forman), and with two parallel cuts showing that it was sent with the specimen, with the stem originally passing through the slits. On one such, the name ‘Ruellia littoralis’ is followed by ‘K’, showing it to be a König name –in this case published by Linnaeus filius in his Supplementum Plantarum of 1782 in which many König specimens were described either under König’s name or one coined by Linnaeus); the hand could be that of Patrick Russell. To another of the names Nerium tinctorium, the letter ‘R’ is appended: an attribution to Roxburgh himself. On a third, an Hibiscus, in an unknown hand (neither Roxburgh’s nor Russell’s) are attributions of names to both König and the younger Linnaeus: ‘Hibiscus Gossypinus K, rigidus Sup’, the latter also a reference to Linnaeus’ Supplementum. It is possible that these could be specimens sent to Hope, or to his successor Daniel Rutherford. 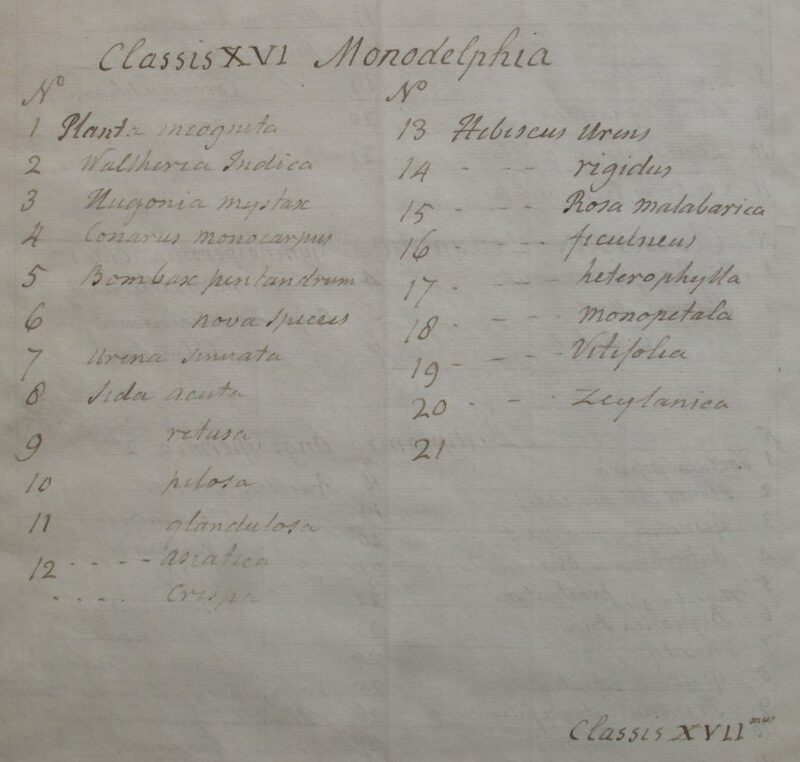 Hope died in 1786, before Roxburgh had really got into his botanical stride, but Roxburgh certainly continued to send seeds to Rutherford for RBGE from Calcutta 1810–3 and St Helena in 1814 (RBGE Donation Book 1810) and therefore almost certainly also herbarium specimens; but in the absence of annotations there is no way of being certain. 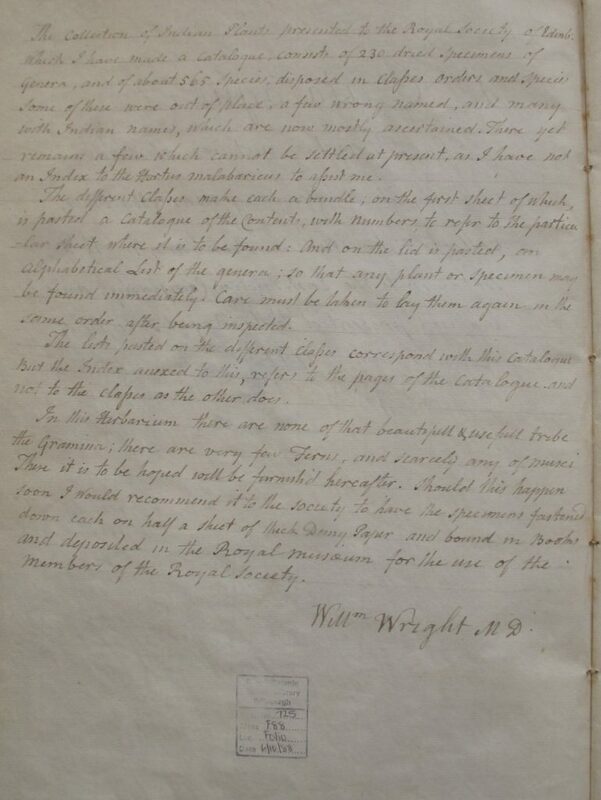 From the identities of the plants, if an extensive search were to be made, it should, however, be possible to ascertain whether or not these were sent back to Edinburgh prior to Roxburgh’s move to Calcutta in 1793. 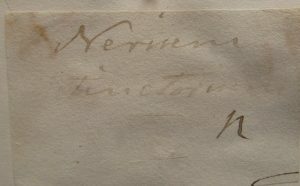 This brings us to an extremely interesting group of five sheets, with long annotations on the verso in the hand of the Linnaean pupil Johann Gerhard König. From these annotations two of them appear to be duplicates of the original material of species described in the Supplementum. They are all on sheets c 23 x 37 cm of eighteenth-century laid paper (the two visible watermarks are: ‘C. Taylor’ and a countermark with initials LVG). Three are annotated ‘over’ in the bottom right-hand corner (referring to data on the verso). Three have the binomial in a large, untidy, unidentified (but neither König’s nor Roxburgh’s) hand on the recto and two have the binomial in a different, equally untidy, slightly more angular, hand and to one of these the name ‘Roxburgh’ is appended. a. Scirpus Michelianus. Capitulo globoso, Involucro polyphyllo longo a Linne species plant. pag. 76. [and in pencil ‘Cyperus squarrosus’ by Russell]. = Cyperus michelianus (L.) Delile subsp. pygmaeus (Rottb.) Asch. & Graeb. = Wrightia tinctoria R. Br. Probable syntype of Nardus thomaea L. f. = Oropteium thomaeum (L. f.) Trin. d. Utricularia stellaris. surculis ramosis. foliis compositis capillaceis. habitat in agris Oryzaezeis profundius submersis & in stagnio [?viget] mense Decbr. Probable syntype of Utricularia stellaris L. f.
e. Schoenus coloratus var. γ schoenoides triceps Frisii prodromus No 23 [and in pencil ‘Kylingia triceps’ by Russell]. = Kyllinga bulbosa P. Beauv. There are many sheets in the herbarium with these two forms of annotation on the recto – one with, the other without, the name Roxburgh – which also show that the five small König sheets were also originally part of the same collection, and it seems almost beyond doubt that this was that of Patrick Russell. These annotations (in the two hands) appear to have been added to the recto of the sheet (as in Banks’s herbarium the original information is on the verso) possibly as late as the 1840s, though the curious hands give a misleading appearance of being earlier in style. On the majority of these sheets, the hand of the original name on the verso (sometimes with additional details) shows this to represent a single collection. The sheets are mostly large (c 27 x 43 cm), but have at some stage been crudely trimmed and must originally have been even larger – none of the paper is dated, but most appears to be Whatman (with either mark or countermark), and could conceivably date to the late 18th century. However three sheets (all with the ‘Roxburgh’ annotation) are of the smaller size of the König sheets, indicating that these too were all originally part of the same collection. Four sheets are shown here as examples – of which two are of particular botanical interest. 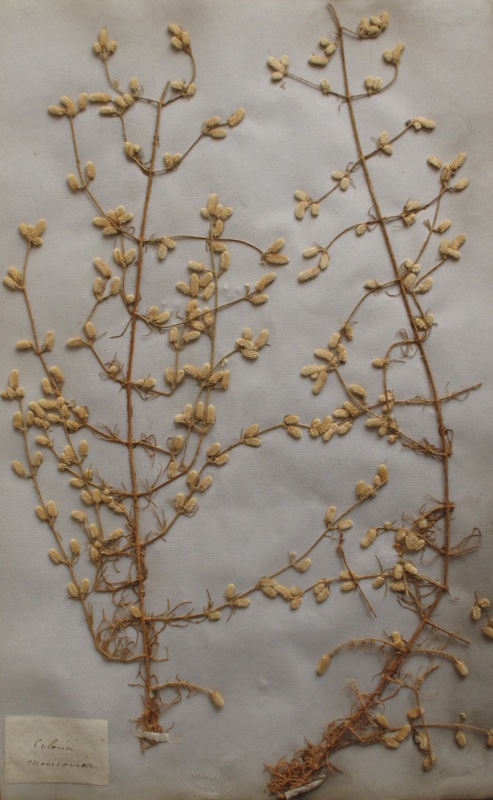 Bergera koenigii is the plant named by Linnaeus to commemorate his student, and perhaps to heal wounds as its genus commemorates the Danish physician J.J. von Berger, who was intended as the dedicatee of the genus Koenigia (see Cleghorn Collection p 32). Oldenlandia umbellata is the ‘chay root’ of great commercial importance as a (red) dye plant on the Coromandel Coast in the 18th century, and subject of a major essay in the first volume of the Plants of the Coast of Coromandel. While the large majority of the specimens have no locality, habitat or botanical information, examples are given here of two that do. One on Scirpus michelianus gives a Latin description attributed to K[önig] and a binomial attributed to ‘Soland[er]’. The label for ‘Aeschynomene nova species [= Sesbania sesban]’ gives an historical reference to a plate in Hortus Malabaricus, botanical notes and a collecting locality: ‘This grows to the size of a small Tree or shrub many years. The Aesch. Sesban is Annual. Madras’. The hand of the names and additional information on the verso of these sheets closely matches that of Patrick Russell as seen in his MS catalogue of Andrew Drummond’s coin collection in the library of Glasgow University, and letters to Carsten Niebuhr in the University of Kiel (with thanks to Janet Starkey for providing these). The case for the Russell attribution is strengthened by the discovery of a sheet of this ‘scrawled binomial set’ annotated with the name ‘Roxburghia rostrata’. This name turns out to have been used on one of the specimens left by Russell in the Naturalists’ Collection in Madras, and therefore to have been published in the Wallich Catalogue – supplement p 83: ‘Wall. Num. List no. 767F. Thunbergia rostrata Hb Russ’. (It does not belong to the monocot genus commemorates his friend, but is in the family Acanthaceae). Within these complex collections are no fewer than four sheets of this plant with an interesting history – both for its eponymy and (dual) naming. These also provide good examples of the collections described above (two originating with Roxburgh, one with Russell) and an additional one with links with the Tranquebar Missionaries in the period following König. When Lady Anne Monson arrived in India in 1774 König announced in a letter to his friend Solander that he intended to name a species for her (Linnaeus had already dedicated a genus to this redoubtable botanist, who had once been scandalously divorced from one of Hope’s second cousins). The plant chosen was an attractive amaranth of sandy seashores that was later discovered to occur beyond India, in Sri Lanka, Myanmar, Thailand, Vietnam, and the Chinese island of Hainan. König died and it fell to others to achieve the commemoration, when two Swedish authors both published the same species in 1782, but in two different genera: in Lund Retzius published Celosia monsonia, while the younger Linnaeus had (slightly earlier) published Illecebrum monsoniae in his Stockholm-published Supplementum. Doubts over the generic placement continued – in the 19th century Martius placed it in Aerva where it remained for more than a century until 1974 when Chris Townsend moved it to a genus of its own (on the basis of its opposite leaves, and seed and tepal morphology); unfortunately he coined a generic name (Trichurus) that had already been used, and it fell to the Indian botanist S.S.R. Bennet to modify the name, so the plant is currently known as Trichuriella monsoniae (L. f.) Bennet. The odd one out of the four early sheets at E is from Robert Wight’s herbarium, a duplicate, probably a remnant from Arnott’s herbarium, sent to E from the University of Glasgow and mounted in the late 19th century. It bears two early tickets, one with the Linnaean name Illecebrum Monsoniae (the other, Illecebrum lanatum, may have been affixed by mistake during mounting). As Wight had specimens from the Tranquebar collection, obtained from J.P. Rottler the last of the Missionaries, which included collections made by Rottler himself, but also his contemporaries J.G. Klein and B. Heyne. Of the other three sheets, one is from Roxburgh’s Royal Society collection, with a name misidentified (or mistranscribed) by Wright: the ticket annotated in his hand reads ‘5. 56. Celosia monoica’. 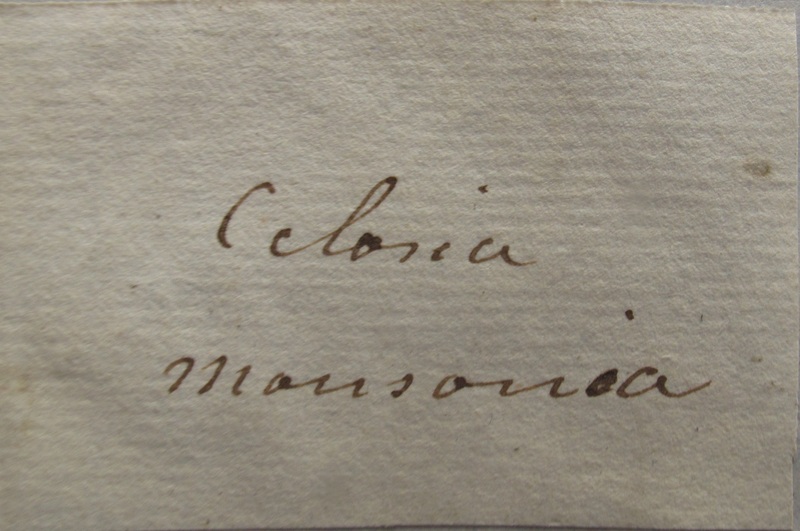 The second is from the ‘scrawled binomial’ set misattributed to Roxburgh, and is annotated on the verso by Patrick Russell with the Retzian name ‘Celosia monsonia’. The third belongs to the ‘Roxburgh ticket’ set, with the name Celosia monsonia in Roxburgh’s hand, remounted on a sheet with an 1843 watermark. It is appropriate that these Edinburgh collections demonstrate the links between the first three holders of the post of Madras Naturalist, as Roxburgh, Russell and König were close friends on the Coromandel Coast. König was the first to arrive, in 1768, followed by Roxburgh in 1776 and Russell in 1781. 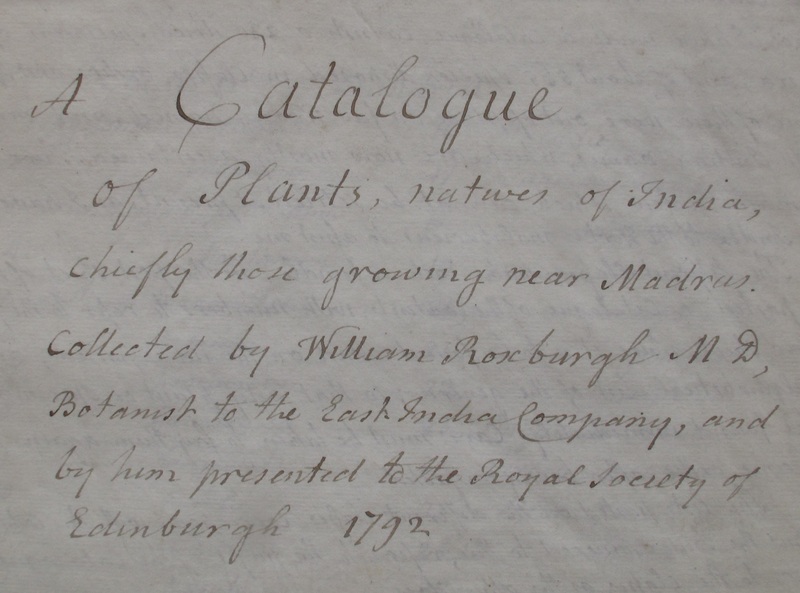 Of these the best known, botanically speaking, is William Roxburgh – not only as a taxonomist, the ‘Father of Indian Botany’, but for his economic botany work, his meteorological recording, his building up of the Calcutta Botanic Garden and his commissioning of botanical paintings. Although the second to reach India, Roxburgh was the third holder of the Naturalist’s post, succeeding Russell in 1789. König, while not one of the officially designated Linnaean ‘Apostles’, was nevertheless the only student of Linnaeus to spend a career in India where he collected extensively (and also in Ceylon and Siam). Although he published little, he left a big reputation, and extensive use of his collections was made by Retzius and the younger Linnaeus. In 1778 he was appointed the first Company Naturalist, but he died in 1785, in the presence of Roxburgh, at Jagganaickpur, the port of Kakinada close to Roxburgh’s base at Samulcottah. Russell was the last of the trio to reach India, in 1781, and returned to London in 1789. It was left to Russell and Roxburgh to pack up König’s papers for despatch to Sir Joseph Banks, and Russell succeeded to the Naturalist’s post. Thereafter there were close connections between Russell and Banks and his librarians Solander and later Dryander, not least over the publication of a selection of Roxburgh’s Icones as Plants of the Coast of Coromandel. The original idea for this was Russell’s: it came to fruition when Roxburgh started to send drawings back to London, and it fell to Russell to write the Preface to the work, in which lavish praise was heaped upon the work of the lamented König. At least his published work was largely zoological (on fishes and serpents) and medical. But Russell did make serious botanical collections and sent many specimens to Banks (now at NHM, herb BM); he also left a cabinet of material, determined with König’s help, with the Madras Government (in 1826 these were returned to London with the rest of the Madras Naturalists’ collections, and were later (c. 1830) distributed by Wallich with the EIC herbarium (which also included a small number of specimens left behind by Roxburgh at Calcutta). In 1805 Russell also left a herbarium in a cabinet to his alma mater Edinburgh University. This had long been a mystery, as although specimens at E are cited in (for example) TL II, Russell’s name does not appear on a single Indian sheet. This mystery now appears to have been solved, in the form of the very substantial ‘binomial scrawl’ collection, some of which bear a later, mistaken, attribution to Roxburgh, and among these are also some smaller sheets that Russell probably acquired from König in India. The much more numerous (the number is known, but certainly many hundreds, scattered throughout E) larger sheets may well have been mounted by Russell himself, after his return to London, with the Edinburgh bequest in mind (an example that would later be followed by that other great pioneer of Indian Botany, Francis Buchanan-Hamilton). As this formed a distinct collection, housed in its own cabinet, there would have been no need for him to annotate each sheet with his name. However, it would seem that the origin of the collection had been forgotten by the mid-19th century recuration of the University Herbarium, by which time the cabinet had probably been discarded for reasons of space. It is possible that by this time Russell’s name as a botanist had been forgotten, and any older Indian sheets simply assumed to have been Roxburgh’s and his name attached to the sheets by a scrawly-handed museum assistant.